One of the last big hurdles we have to overcome with all this wedding planning is finding some manner of entertainment. We'll probably go with a DJ, simply because we don't have the ability to decently audition live bands; as such, we've hunted down a couple DJs, and have an appointment with one in a couple weeks when we come back from Europe. The prices seem to vary a lot; the DJ with whom we have an appointment quoted us $650, while the others go up to $1,295 (I'm sure there are those that cost more). Most offer various packages with different prices that depend on the length of the reception and can include extras like a bubble machine. Most seem to include optional fancy lighting; a few have a la carte options, and one or two had the option of managing one's account (including music playlists) online. With the company with whom we have an appointment, we were given an approximately 15-page questionnaire about our musical preferences. We don't want anything like the Bouquet/Garter Toss, Multiplication Dance, and so on; this eliminates a lot of musical choices, but there's still having to choose songs for our first dance, the bridal party's (and our) grand entrance, things like that. But what we were strangely having the most fun with was choosing the Do Not Play list: These are the songs we do not want played at our wedding under any circumstances. Dammit, at my wedding there will be no Tubthumping, Wang Chunging, chicken dancing, Shania, Queen, polka, or disco! And I hate Kool and the Gang's "Celebration" with a passion of a thousand burning suns. (Why is this song played a few dozen times at each event?) Said list will likely continue to grow, but we were both giggling and horrified at some of the "standards" that seem to be required. The questionnaire gave a lot of suggestions that immediately went to the "Do Not Play" list. Ed wrote a blog entry that sums it up pretty well. Throughout this entire process of planning, one particular photo from Awkward Family Photos has been going through my mind. I'm sure the photographer just happened to catch the groom at a weird moment, but the mere thought of this photo causes me to go into a fit of giggling every time I think of it. 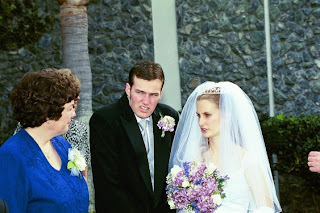 It's entitled "The Stinkeye" and the caption below it on the website reads, "You can call her Mom now."